By simultaneously examining the concerns of design, production, purchasing, finance, and marketing from the very first stages of product planning, concurrent engineering makes doing it right the first time the rule instead of the exception. This should be the first book managers read when they are ready to eliminate waste in the product development process. An introductory handbook, it gives managers 16 clear guidelines for achieving concurrent engineering and contains abundant case studies of Japanese, U.S., and European company success stories. Defines the concurrent engineering task force as a full-time, multidisciplinary unit of operation. Discusses the necessary interdependence of concurrent engineering, Quality Function Deployment, Total Quality Control, and CAD/CAM. Shows how concurrent engineering can be structured to fit your company and used to gain flexibility and efficiency. "Corporate survival in the 90s depends on the ability to fully satisfy key customer requirements. CE (a philosophy) and QFD (a methodology to implement CE) are the first steps towards that goal. This book provides a balanced discussion of theory, implementation techniques, and real examples from current practitioners to guide the readers to the ultimate goal: Total Customer Satisfaction." "The author has heard the 'voice of the customer' and responded well. 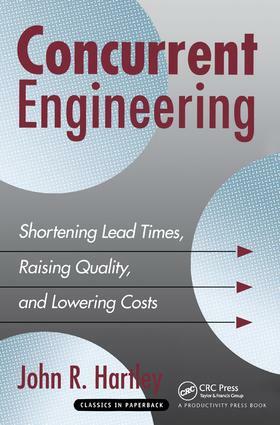 His book explains the concepts and tools of concurrent engineering and presents case studies to guide the reader through its implementation. It should be read by anyone involved in getting a product from design to the customer."